Light colored suit for anytime. BEST SUIT RENTAL PRICES IN PHOENIX!! We have Suit rentals for Holiday Parties, weddings, Suit rentals for black tie affairs, Suit rentals for Quinceaneras, Suit rentals in Phoenix for any occasion. Rose Tuxedo has the hottest styles of Grey Tuxedos and Grey Suit rentals and Midnight blue suit and Slate Blue suit. Same day and no rush fee. *We carry a wide selection of suits for Holiday Parities, weddings, job interviews and more for the best prices around! Renting tuxedos for wedding in Phoenix and a suit for a wedding has never been more easy! Men’s suit rentals is our specialty. 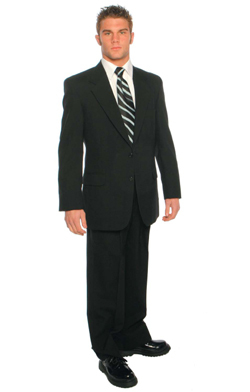 Designer Suit rentals in Phoenix AZ at Rose Tuxedo are available in all sizes and in stock for same day rentals. Black suits, Grey suits and more. Suit rentals Phoenix and Suit rentals Mesa AZ. Suit rentals can be the more sensible means of preparing for a big event. There are a couple of factors that must be considered when deciding between renting or buying a suit. Attire for weddings and proms can be quite pricey, so suit rentals are the more economical decision. When making the decision between renting a suit and buying a suit, think about how many times after the event the suit will be worn. If the suit is only going to be worn for that specific event, renting a suit might make more sense than buying a suit that is just going to hang in the closet. A person trying to decide whether to go with suit rentals or a tuxedo rental must know the difference between the two items. A suits shirt is a plain shirt, long sleeved with full length buttons while a tuxedos shirt have pleated fronts, might be worn with cuff links and other accessories. A suits jacket lapels are made with the same material as the rest of the jacket and a tuxedos jackets lapels are covered in satin material. The suits trousers have no stripe on the outside of the pants and tuxedos trousers have a satin stripe running down both legs of the pants. Suits are worn with formal shoes, with a tuxedo patent leather shoes.Imagine going to a funeral sporting a shiny satin lapel and satin stripes running down your legs or maybe showing up to a wedding with a pleated shirt. The tuxedo can make a loud statement while also taking the attention off the intended event. A suit is classy and always appropriate for any event. Wearing a suit makes a statement of formality without taking away from the occasion. Suits and tuxedos are appropriate for similar events but wearing a suit makes a statement without all the attention of a tux. Renting a suit is the efficient way to prepare for a prom, wedding, funeral, or that big job interview. A suit will also show an understanding of formal wear without bringing unneeded attention. Family owned and operated since 1982, Rose Tuxedo, is the place to go in Phoenix, Arizona. With three locations in the valley, same day service, no rush fee, black suits, Grey and navy blue-all designer suits and all sizes in men’s and boy’s, Rose Tuxedo has great prices. Contact Rose Tuxedo for those suit rental needs, rent a suit at Rose!